For many applications in building construction a combination of light-weight construction with high energy dissipation capacity and (locally adapted) puncture resistance is of increasing interest. This especially holds true for regions having high earth quake or thunderstorm frequency or being endangered by rock fall or avalanches, but also for especially endangered buildings covering sensitive technologies as e.g. in chemical industries or power plants. Biology offers a multitude of potential concept generators possessing one or several of the requested properties. In this project biological light weight constructions acting as energy dissipating protective systems are to be investigated in order to become quantitatively understood as to their form-structure-function relationship, abstracted, adapted and transferred into bio-inspired built structures. Different biological systems are chosen to act as source of inspiration for different types of impact protection. The biological role models include plant and animal examples, in particular sea urchin spines and skeletons, impact and puncture resistant fruits and seeds and the bark and cortex of trees and lianas exposed to sudden mechanical impacts. The biological role models will be abstracted to evaluate them by engineering simulation, because it is not the aim to comprehend the full complexity of the natural examples in all details but to deduce the principles of carrying load, dissipating energy, damping impacts and protecting against puncturing in a comparative manner. By these processes not only the basic structural and functional principles of damping, energy dissipation and puncture resistance of the biological role models will be deduced and understood but the simulation will also help for a better general understanding of the biological concept generators in the process of reverse biomimetics. Additional goals of this project are to accomplish a classification system for the structural and functional basis of energy dissipation in plants and animals and to combine ways of energy dissipation and puncture protection identified in plants and animals. This approach allows to find novel technical solutions for a transfer into prototypic components and demonstrators for building constructions. Together with B01 and B03 extensive test series will determine the matrix of properties and functions of the biological antetypes as the basis for theoretical work and numerical simulation, which are intended to deliver insight into structures to both architecture and biology. The technical implementation will be based on the use of graded/structured porous and/or fibre-reinforced concrete and ceramic materials, enabeling light-weight constructions with high damping and energy dissipation capacities. Puncture resistance can be obtained by locally adapted mechanical properties like strength, toughness or stiffness through variation of pore structures, porosity levels, fiber type, density and arrangement. Both laboratory scale work in ceramic systems for a principal verification of concepts as well as work on pilot plant sized models for concrete based models will be carried out to obtain both fundamental data for reverse biomimetics and architectonically directly applicable results. In particular for the latter a close collaboration with B04 (manufacturing of demonstrators and prototypes) is planned. The project will provide a basic concept for the analytical description of such structured materials and composites. The models developed here are envisaged to be incorporated into the advanced simulations of B03 (multifunctional simulation) and to help to tackle the problem of scaling (B01). Pomelo peel, SEM images of peel samples cut parallel to the epidermis. Left: dense part of the peel adjacent to the fruit pulp. Right: less dense outer foamy third of the peel with two vascular bundles. 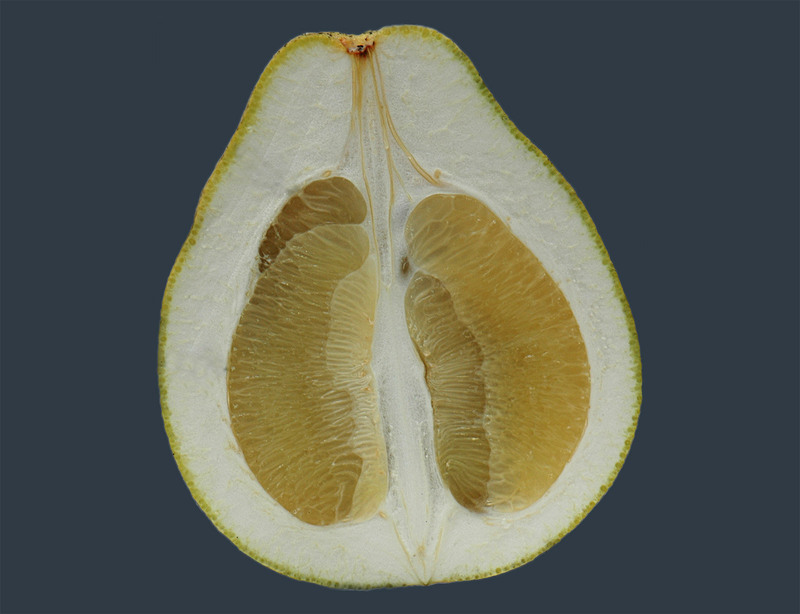 Longitudinal section of a pomelo fruit, showing the thick hierarchically structured peel which is crucial for the excelent impact damping.